This site is completely dedicated to the Almondsbury UWE Football club and football, in general, as a sport. If you are following FC Almondsbury UWE, then you have come to the right page. Here, on this site, you will learn all there is to know about this team, its players, and the matches that they are playing. Football is an international game and almost everyone knows about it even if they are not actively following the game. 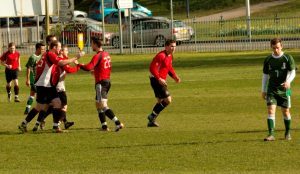 Fans tend to follow their favourite teams, football clubs, and Almondsbury UWE football club has many followers. This site was built to honour those fans. We are football fans and love Almondsbury UWE football club, so we thought it was a good idea to give the fans a place to stay updated on what is happening with the team. You will read about the team and the matches they are playing. The division they are part of and their history with the sport. Many fans, us included, like to read a football club’s history. It gives perspective to the club. We think they have a really amazing history that is worth associating with. We suggest that you go through the pages of this site to know more about this amazing club. We have also talked about the game of football and shoes. Yes, shoes are one of the most important accessories of this sport. All in all, this site is a great place to be part of Almondsbury UWE football club and follow them.